How have the mode shares of journeys to work changed by different home locations in Melbourne? I’ve animated each image to alternate between 2006 and 2011, so you can gaze at them and spot the changes. But you’ll need to click on them to enlarge and see the animation. This map excludes those who used private transport to reach public transport. It shows that on the suburban fringe, the vast majority of people are still using private motorised transport to get to work. Areas without significant growth include Sunbury, South Morang, Greenvale, Rowville, Berwick north, Skye/Carrum Downs, Mt Eliza, Dingley, areas around the Ringwood-Lilydale rail line, and Westmeadows. There is growth across mode areas of Melbourne. You can see a massive difference in Roxburgh Park Craigieburn area following the extension of suburban electric services to Craigieburn. in Doncaster area following the introduction of 7 SmartBus routes (including 4 to the CBD). in pockets between the Ringwood and Dandenong rail lines in the middle eastern suburbs. These areas had SmartBus routes introduced in 2002/2005, and perhaps it is taking a while to translate to bus in journey to work. Around Abbotsford/Collingwood, perhaps reflecting increased train crowding and introduction of four SmartBus routes along Hoddle Street creating an extremely frequent service to the city. You can see increased mode share across the network, particularly around the outer end of the tram route to Bundoora (zone 2 only in 2006, included in zone 1 in 2011) (but less so in Vermont South). You can see gains in the Brunswick, Northcote, Kew and Foostcray areas. I can see little change between 2006 and 2011, which is in line with little change in the overall share for Melbourne. Cycling continues to grow rapidly in the inner northern suburbs, but also a little to the inner east and inner south. With the introduction of Parkiteer cages at train stations, was there any increase in the number of people riding to train stations? The numbers are so small, it is difficult to see spatially, but there was a substantial increase in overall numbers from around 1200 to 1800. You can see increases around the Dandenong rail line, between the Glen Waverley and Ringwood rail lines, around Werribee/Tarneit, and around Sydenham. Here’s a map showing the mode shift towards public transport by Statistical Local Area (SLA), the smallest geography for which results are available for both the 2006 and 2011 censuses. The biggest mode shifts were in the City of Melbourne, followed by Wyndham – south (Point Cook), South Yarra/Prahran, and Moreland – north. Nowhere in Melbourne did public transport mode share reduce. I’m sure other people will find more patterns in the maps than I have been able to today. Please comment on any interesting finds. I might come back later and update this post when I have more time. I will aim to do a similar exercise for other cities soon. This entry was posted on Tuesday, October 30th, 2012 at 5:27 pm and is filed under Melbourne, Mode share, Mode shift. You can follow any responses to this entry through the RSS 2.0 feed. You can leave a response, or trackback from your own site. Thanks Chris, very helpful. Wondering what you found regarding walking – walking only and mode share with PT etc? Nice work, as always Chris. Ben, sorry about that. Walking only mode share maps now added. Can you spot much difference? Hi Raili, you can get that data from TableBuilder Basic (although only for place of usual residence). You’ll get hundreds of possible mode combinations returned and have to sum them up. I’ve added a map showing mode shift by SLA (the level below municipality). Chris, Fantastic stuff as we’ve come to expect. Would it be correct to infer that the bus/rail changes come from both the MOTC service upgrades (particularly the span of hours improvements into the evenings) and the Smartbus package (high frequency/span of hours) combined, or is one improvement weighted more highly in this growth? Scott, if you stare at the train + bus map long enough, you’ll see many increases in areas served by SmartBus routes (especially around Warrigal Road, Springvale Road and Northland), but also some areas that don’t have SmartBus services (eg Werribee/Tarneit and towards Sydenham). Unfortunately I cannot easily overlay the SmartBus routes onto the map. I suspect SmartBus will have had more impact than extended span of hours on local routes, as most local routes have always operated in peak periods and SmartBus usually has a higher frequency advantage in the peaks. 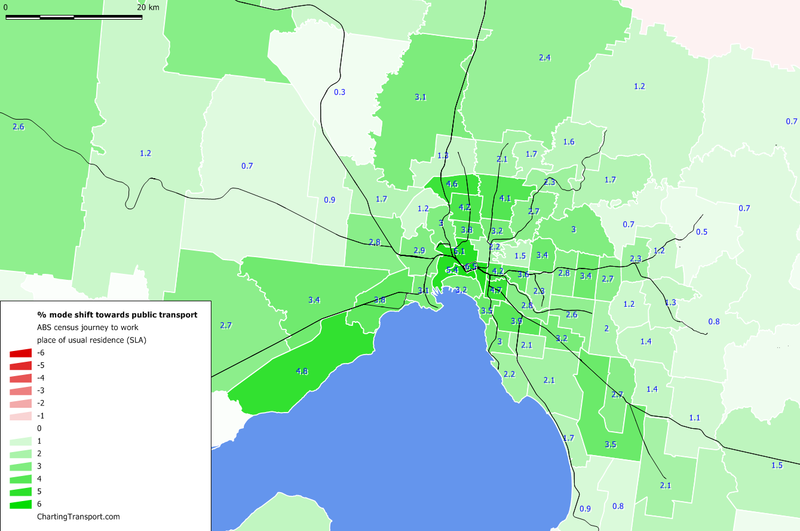 Train + bus mode share in Melbourne has risen from 0.7% in 2001 to 1.0% in 2011. In Perth it went from 1.0% in 2001 to 2.0% in 2011, but Sydney was highest with 2.5% in 2011. What’s the biggest cycling postcode/CCD you’ve found Chris? Greg, use of bicycle in journey to work in Melbourne peaked in an SA1 in East Brunswick, on the south-east corner of Glenlyon Road and Lygon Street, with 28.1% of commuters using bicycle to get to work. It was closely followed by a pocket of Clifton Hill between Alexandra Parade, Smith Street, Wellington Street and Queens Parade at 27.9%.